Naot is an amazing company that makes comfortable stylish shoes for women. I did a blog post back in the fall wearing another style, but the pair I’m wearing in this post are my favorites! You all know from following me that I’m a shoe girl and I especially love booties! I think it’s important to have an assortment of styles for different activities and I choose these because I thought they would be great for wearing by the fire, going to a cabin in the mountains, or just any outdoor event that is casual. 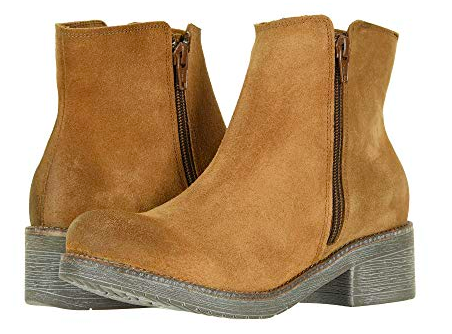 These shoes have a rustic feel and are very very comfortable. If you’re looking for the ultimate comfortable shoes that have an “outdoor” sporty look, you’ll love these shoes. You still may not be familiar with this comfort brand, so let me tell you more about Naot shoes! 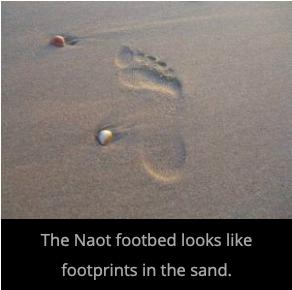 The Naot footbed looks like footprints in the sand. This material used to make Naot shoes molds to your foot and helps provide stability, support (even arch support) and helps properly distribute weight around your foot. This can help reduce and may even prevent foot problems. The special footbeds are covered in suede while the upper parts of their shoe are made from Italian leather. This construction combines to create an amazing footwear experience. Naot is orthotic-friendly, but most people don’t need an orthotic because the shoes themselves offer so much support. The arch support, heel cushioning and shock absorbing outsoles can be helpful for plantar fasciitis. Experts say the sharp pain of Plantar fasciitis in your heels occurs when you develop tiny tears in the thick rubber-band like tissue that runs from your heel to your toes. Thankfully, I’ve never had this problem, but I know a lot of people do. As you can see Naot (which means “Oasis”) should be on your list of go-to comfort brands. They have so many other styles so be sure to check them out! Thank you to Naot for sponsoring this post! I love these booties and you’ll be seeing them again on Crazy Blonde Life!